I have compiled these lists based on what I keep in stock for my 20 chickens. I have first listed what I would consider essential to looking after your hens and the second list is what I consider useful to have in stock just in case. I have not included common items such as food, grit or bedding and cleaning equipment. The products can of course vary slightly depending on your preferences or local supplier availability. I have included links to the where I usually buy these products from where possible. I haven’t included food or mixed corn. The sub menus give more detailed information about some of these products which I have included as links within the lists. Apple Cider Vinegar or ACV is given to my girls for one week monthly. The product you buy must be unrefined to get the benefit and usually is cloudy. Don’t buy human grade ACV which is filtered and not as beneficial. I mix it at 2% dilution rate. It has anti-bacterial benefits and discourages coccisidiosis and worms by making the gut slightly acidic. Poultry Shield: is a very safe detergent that is good for removing organic matter and killing bacteria that cause diseases. It does not contain any poisons or caustic chemicals like some household products. It is very good for controlling Red Mite by washing off their waxy outer coating. Poultry Shield gets into cracks where mites hide and where powders can’t reach. Diatom: A wonderful product that I would not be without. Totally organic (made of fossilised diatoms). I use this in feed to help keep worms at bay (5% in feed from time to time) and also dust in the coop during the summer months for Red Mite control. Red Mite Powder is suitable for organic production and can be used on the hens themselves. Mites are usually in the house, only going onto birds at night for a feed so this helps protect them at night. 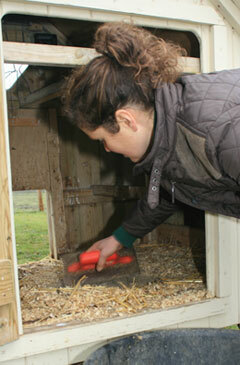 You can also use Red Mite Powder around the nest boxes. It contains tea tree and always leaves the nest boxes smelling wonderful! Worm Count Kit. I use a worm count kit before using a wormer. These postal kits are excellent, they come with everything you need to take a sample and send it off to the lab for analysis. You will receive the results by email and advice on whether you need to use a wormer. Battles Poultry Drink: I use this multi-vitamin drink at times of stress and during the moult. It is particularly good if birds are recovering from Red Mite since it contains iron phosphorus potassium manganese and copper. It contains a selection of 5 minerals in a high energy sugar syrup base. and supports all round condition and health. Just add directly to the drinking water or the daily ration. Disease of Free Range Poultry: by Victoria Roberts. Written in plain English and a very valuable reference book to look at if something goes wrong. This is a very good book that I would not want to be without. There are other books I own on problems with poultry but this one is written for the UK market and some other (cheaper) books cover diseases and medication we don’t have here. The best item I own! A door opener / closer can be set to open the coop at 7am and close it at dusk after the girls have gone to roost. I can get home after dark knowing the girls are safe from predators. There are a few different versions available on the market, look for VSB or Chicken Guard. A small amount of cod liver oil added to feed during the moult, helps birds to re-grow feathers. It’s also useful for mixing wormer with feeds – A small amount in a pot mixed with a wormer helps to get the powder to stick to the pellets without going to the bottom of the hopper. Verm-X is a herbal supplement that helps prevent internal parasites (worms) and keeps birds in good condition. I use Verm-X regularly but use Flubenvet if I have a confirmed case of worms (I test with a worm count kit above first and 99% of the time have the all-clear). It is easy to administer with the 3.5g scoop that comes in the pot. The recommended dose is one scoop per bird per day. To identify birds that look the same. For example if there is a bird off colour, I will ring her to make it easy to keep an eye on her in the flock. If you are hatching your own and (eventually) keeping different ages of chickens, together then also consider the more permanent rings from the Poultry Club of G.B. that have a unique number and the year stamped on them. I use dummy (or pot) eggs when I have a broody hen and I want her to sit for a few days to make sure she is keen. Once she’s keen, she can be transferred to a broody coop and can sit on some eggs. If one of my water containers freezes or gets broken by accident, I always keep a spare. A 6 litre container lasts my 20 girls 2 days, (although ideally you should be giving your hens fresh water daily) but sometimes I will empty some out on the second day to freshen it up and I still have a little spare in the container. 4 litres should be enough for 12 hens. Do you find anything you can’t live without? Please leave me a comment below. Hello, I love this site! It is so helpful and well set out! I am getting a wooden hen coop to set up and wonder if you could advise me on the best product to guard against red mite before I put any chickens in it. Do I use red mite powder or would a paste of Diatomaceous Earth be best, as recommended by one of your readers. If there are no other chickens on the ground they will run on, I worm after 6 months. ACV can be given from chick upwards. Hello, and thanks for such an informative and helpful website. I have a question about Red Mite Powder – is this effective at preventing fleas and lice, or does it just act against red mites? Also, might seem a silly question, but if it’s dusted in the nest boxes, could it leave a residue on the eggs and could this be harmful to humans (e.g. if you hard boiled an egg)? Yes, they work against most insects – lice and mites. 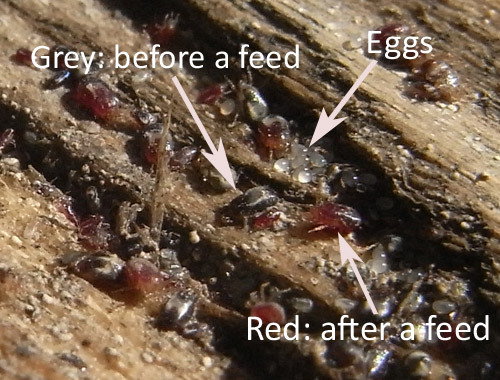 Most organic red mite powders are made up of diatomatious earth (DE) and a scented oil such as tea tree. Both are pretty safe. For example they use DE when storing wheat and other crops to stop various mites and insects from damaging the food. I guess a hard boiled egg with residue on it would go into the water and then the shell is peeled off. There would be a very reduced risk I think. If you are concerned, perhaps you could wash the eggs before use? A suggestion of possibly something to add to your very useful list (please feel free to disregard as I only have 3 days experience! )… Violet antiseptic spray? I have one hen that is getting her vent pecked by the other two and they have drawn blood. I was wondering what you keep in stock in terms of medicine such as things for scaly leg mite or cuts and abrasions. What types of medicines do you keep? and is it worth a 3 bird flock getting the whole lot “just in case”? I tend to keep a few medications in stock – possibly more than most people as I keep quite a few birds! love your site very helpful. what’s slightly confusing is that you say keep dried mealworms in stock but on the defra page on this site says it’s illegal to feed them to hens? Yes, technically it’s illegal to feed these as it is to feed kitchen scraps but there are many people out there feeding mealworms to their hens. I’m updating the pages at the moment and have taken this on board so I’m not advising you to break the law! Thanks for your feedback.